If you leave in Holland you probably use a bicycle very often. The infrastructure in this country is developed in such way to allow the usage of bicycle almost everywhere. Standing in my car on the stoplight and watching all cyclers passing by I was always wondering: how crazy would be the traffic in Netherland without bicycle. Many world cities try to rearrange their roads to incorporate cycle corridors. It is not always safe! In Holland the safe cycle route safely separated from main car steam exist already for years. But when the sun is shining you will not hesitate to put your mini-skirt, high hills and go on your bike. 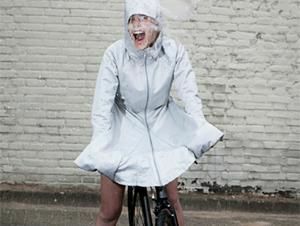 Unfortunately there are more rainy days in Holland and you need to protect your body if you do not want to be completely wet. 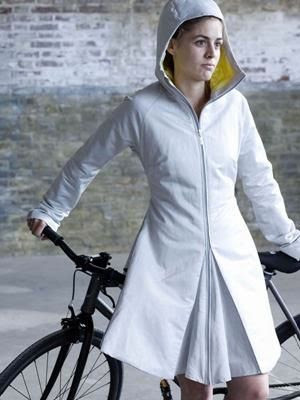 The former student of Design Academy Eindhoven Kyra Meilink launches the fabrication of the stylish coats that can be transformed into practical rainwear just in one second.